The Astagina Villas & Resort is another Budget hotel in Legian Bali from just AU$66 a night. Located just a block away from the beach down a long driveway, this little gem was a great surprise. The newly built hotel and villas were a great find with a large dining area and bar, alto the food was a little expensive and the server was a little slow, I will give them the benefit of the doubt, because it seemed the staff were still learning their rolls. The hotel has 2 pools, the main pool with lots of sun beds and pool bar, as well a 2nd pool by the grass perfect for the kids. The rooms were quite large and modern, with unique wood features and floors, the room was clean with a comfy bed and pillows. ?The bathroom was clean and modern with a shower and bath and the usual toiletries including a hair drying and make-up mirror. In your room with will also find a Bar fridge, flat screen TV, DVD player, Tea Coffee and daily water. As well as a small balcony overlooking the awesome pool. ?The hotel also offers one of the fastest internet I found in Bali at 16Mb per second from the free in room Wifi. If you need decent WiFi, then this is the place to be! It’s the fastest WiFi I have found in Bali. 1st floor gives you direct access to the pool. Get a rooms over looking the pool. 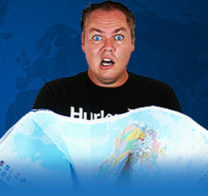 Sign up now for FREE travel advice, exclusive stories, travel photography, motivation, and more! Copyright 2007 - 2016 All rights reserved.